Remember what it was like when you first started playing the guitar and experienced those first doses of success? Everything was so exciting and new and you just wanted to play, constantly! You didn’t need to be taught how to practice. You already knew. You played simply because you loved the instrument and the sounds it made. However, at some point - and I know every player will corroborate - the relationship takes an unexpected turn. The once blossoming, idyllic, love affair begins to fade. A transformation occurs; one where practicing becomes a chore. Why does this happen? And when it does, how do we find our way back to the original inspiration and joy? Over the course of some twenty odd years as a guitar instructor, one of the main recurring questions I hear from students is, “How do you practice?” Usually, this question is indicative of some larger underlying issue; a student’s temporary loss of direction (motivation) due to a plateau being hit (stalled progress). The “you” in this question is really “I”. And they are looking for a way out of a rut; a how-to guide plus more, because they understand the bottom line: If you don’t practice, you won’t get better, and the rut will deepen. As guitar players, falling into a rut is a condition we all face sooner or later. We approach a breaking point of tedium, where everything sounds the same, and lack of motivation rules the day. The good news is the remedy to such a condition exists in simply modifying a few elements of, or approaches to, your practice routine. In this article I will answer the “How do you practice?” question by laying out five of my own philosophical and pragmatic strategies that I have used over the years, and still use, to great effect in helping me find my way again; out of my own ruts back to inspired practice. They can help you too. Make a Plan – Before you even pick up your guitar, create a few clearly defined goals that you want to accomplish. Perhaps you will focus on a specific set of tunes, a single tune, or a section, no matter, just keep the goals simple and direct. Do not make a time commitment, only plan for accomplishment. Work in short bursts and take breaks. A lot can be accomplished in such frequent, focused, and short sessions. This strategy helps to ward off tedium and to rebuild momentum. Just Start – Feeling so burned out that you can’t come up with a plan? Well, then just start playing. Play something you are comfortable with whether it is your favorite piece or chord progression, a familiar picking pattern, scales, whatever, just something that is easy and will get you playing in an unthinking manner. Forget about goals. Be patient and allow yourself to settle into a groove. This exercise will get your hands and mind in tune, warmed up, and put you in the zone so to speak. You’ll be surprised by where you land and where you will want to go next. Change Course – Stop working on your current projects and try something new. Explore some new repertoire, new chords, new techniques, new tunings, a new musical genre, even a new guitar. All of these changes will force you into new territory. You will learn, you will expand your horizons, you will revitalize your older material, and you will be inspired to practice. Just Don’t Practice – Sometimes the best way to practice is to not practice. This strategy is more of a meditation. I call it hands free practice. Take a break. Take a walk. Find some other prolonged alone time to review your technique, rehearse some pieces, or try to solve some particularly difficult passages; using only your mind. Try to see and hear all of the details. You’ll be surprised how much clarity will be added to your playing the next time you pick up your guitar. Return to the Beginning – Sometimes it is necessary to come full circle as a player in order to move ahead. As you become a more advanced guitarist, progress becomes harder to detect. What used to be easy giant steps become more demanding smaller steps, and that perceived lack of progress can be a source of frustration. This is the time to take a look at what you have accomplished so far. This is the time to revisit some original sources of inspiration. This is the time to remember why you play the guitar in the first place. Remember what you love about the instrument. Recall those early feelings of exhilaration, excitement, and joy. Take the time to appreciate the freedom and the limitless possibilities of expression. Remember the joy. As a kid, in the summertime, I enjoyed a comfortable nightly ritual - watching the Twilight Zone reruns on TV. Every night, at 10:00PM I was free to drift with the surrealism that ignited my imagination. I felt safe entering the Twilight Zone. During this time, I would often crack open a window to allow the outside ambient noise additional space to move and mix within my basement sanctuary where I lived. I loved the summer air, the sounds, and the black and white images. Everything was where it needed it to be. As I stepped out of the studio the other morning, preparing to face another day, I was compelled to turn back and snap the photo you see above. Something about the composite of objects caught my eye. What you see in this image is my place of work; yes, another sanctuary of sorts. See those guitars? Nothing can penetrate that force field. Everything is surrounded by deep green and according to some color theorists: "Green has strong emotional correspondence with safety." This my modern twilight zone. I am comfortable here. Everything is where it needs to be. Now that I am embarking on an old-new (and exciting) path - formal education - there are many more structured demands presented before me, adding to my already busy work-family life. I have many more deadlines that are forcing me to work in a new way. I can no longer rely on my own structured/non-structured way; a freelance schedule is comparable to no schedule. My time perception is altered and I am being pulled out of my comfort zone; my twilight zone. I heard an interesting interview with Garrison Keillor the other morning on MPR. One caller asked - from one freelance worker to another - how he goes about scheduling his work day and inquired about his writing routine. He responded - I am paraphrasing of course - that he works from roughly 4:00AM until noon every day (when he is at home) and that you cannot underestimate those precious hours before the rest of the household wakes up. Also, any problems or tensions you went to bed with seem to be magically suspended during those twilight hours. I get that. I can relate. I am now back to my own 5:00AM wake up call...5:30 after a few snoozes. Mr. Keillor also went on to describe his writing methods while traveling and accounted for his prodigious output week after week given his busy schedule. He has learned to work on the fly so to speak; in any free moment, in any hotel room, while waiting in the lobby, in a restaurant, where and whenever just to keep the momentum going. This is what I need to develop - a spontaneous work ethic and not having to rely on everything being just so before I begin to write. I need to leave the twilight zone; my comfort zone. On January 11, 2012, I turned 41. The day before, Van Halen released the first official single from their forthcoming album, A Different Kind of Truth, with original singer David Lee Roth. The last album with Roth, 1984, was released on December 31, 1983. I was 12 then. I am a fan of the band. No doubt. However, they have not been as profound an influence on me as say, Rush or the Replacements, but I have been looking forward to this reunion with just as much anticipation as the rest of the fans. At heart, I am part classic rocker. I have listened to the new tune about 50 times now, always left with a different reaction; mostly unsettled joy. As a musician, aging rock stars have always been the most stark reminder to me of how fast time moves and that I too, am getting older. As a father, watching my daughter grow up has usurped this reminder, but I digress...at the age of 12, who cares? At 41, everything matters. Time to get moving. Watching Van Halen's new video is like observing the ruins of a magnificent temple - be it Angkor Wat, the Sphinx, Delphi, or whatever - you can still kind of see how opulent and powerful it was back in it's day. Now, it is just a hollow shell, an outline, a sketch, and you yearn and try so hard to make it as it was - by way of imagination or sheer will power. Both methods fail, though imagination can be relatively effective. A feeling of disappointment can rule, but you know what? When observing such edifices there is still much magic and beauty to behold. The same can be said about an aged - and relatively ancient - rock band. Rock solid foundations are the last thing to crumble. But here is one big difference: We have seen and can still see bands in their prime. YouTube. That is where you can get stuck. The current past is never that far away. One URL, a few search words, a few mouse clicks, and there is your time machine. To be sure it can be a dangerous, yet exciting trip to reality. What does this all mean? I am not sure. Today it is January 12, 2012. I am 41. A gradual slowing of tempo...slow. I have recently received a few e-mails asking me, "What's up with your blog?" I appreciate the inquiries and it's very nice to know that people are reading my articles. Apparently, I have an audience. So what IS up? After about a year and half or so - since my last CD, Many Moods, was released - I have taken my foot off of the gas pedal. No longer in a full court press of self-promotion and all the generally unpleasant (from my perspective) details that go along with that process. I am sick of myself (see the irony here?). I have not come to a stop per se, certainly not a Fine, just a gradual slowing of tempo. Moving on to a new section? A new development? A recapitulation? Or, a new piece altogether? I haven't figured it out yet. Every few years I am handed an exceptional show that ends up being a peak performance of the time. This year, it was an opening spot for Adrian Legg at the Cedar Cultural Center in Minneapolis. It was an absolutely wonderful evening in every respect. I was on top of my game and certainly felt that while my playing took a leap forward (upward? ), it also felt like the final show of my current stage; the end of this particular epoch. Time to regroup and move forward. I must reiterate, it was positive in every respect, however, with any peak performance comes the inevitable decompression period - the "post-show blues" as many performing musicians know all too well. It happens every time. The higher I fly, the harder I fall. This particular decompression period continues to linger. So, currently I AM regrouping and moving forward though at times struggling to keep up. I am still playing most days, keeping the chops functional for the handful of shows I have this Summer and Fall. Really loving the new work I have taken on for Hal Leonard. Every week marveling at the progress my students make. Ready to run another half marathon. Working on posting more blog articles as I continue to develop my writing. And, certainly, I am very much looking forward to spending some super high-def - 3D quality time with the family this Summer. Speaking of which...every night I think about how fast Sadie is growing up. I am both thrilled by how well she is doing and saddened as I see her gradually drifting away - becoming more independent and needing Daddy less and less. Nothing new. I know. Just need to figure out how to hang on to the sweetness a little longer. I present you with Part II (and the conclusion) of my first vlog entry which offers some insight into my composition process. Here is a link to Part I in case you missed it! I often video myself to help remember the ideas - both good and bad. Also, since the writing is often spread out over several months, or more, it is a solid reference point to get me back to the essence of the tune in process. I hope you find this amusing and somewhat insightful. I have. Time for a change of pace. I have established a pretty solid and consistent groove up to this point. Here, I am pretty much playing off what has already been established, but, slowing things down and re-arranging some notes. This is what will become the C section and will open up some space for a little improvisation later on. The missing link. I needed a way to get out of the breakdown and establish a connection back to the intro. It is a slow build back to the main groove with some slight melodic variation. Frustration sets in. After spending several hours (days) on a piece, things can tend to get muddled and oddly worse before it all gets better. I hate these moments but thoroughly believe they are a necessary part of the process. It really challenges you to believe in what you are creating. I will post a performance of the completed tune next month on my YouTube channel. Thanks for viewing, reading, and listening! I present you with my first vlog entry which offers some insight into my composition process. I often video myself to help remember the ideas - both good and bad. Also, since the writing is often spread out over several months, or more, it is a solid reference point to get me back to the essence of the tune in process. I hope you find this amusing and somewhat insightful. I have. 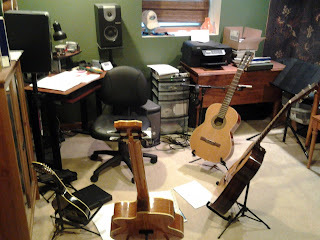 The gathering stage where I record the initial ideas soon after discovery. This is what will be the Intro and the A section of the tune. This is one of many searching stages. It is the initial process of developing the tune after landing on the hook. Just brainstorming and trying to figure out where the tune is going to go. This is the infant stage of what will become the B section. Distractions. The initial process of writing this tune was accomplished sneaking away while Sadie (my daughter) had friends over. At the end of this clip you will hear the tune Footloose cranked. They were playing a game they called, "Let's annoy Daddy". An apt title. Also, I have no idea why there is a shirt draped over my shoulder. The next morning after the initial gathering. Here you will see more searching and a hefty dose of WTF? Starting to gel now. The tune is starting to come together as I clarify the parts and start to assemble a form. This is the Intro - A section - B section. Also, I had just installed my new webcam. Looks and sounds sooo much better. For the concert guitarist, a background gig is a grind. They are a work of necessity, well paid functional playing, essentially, music as a service. Period. Whether it be a restaurant, wine bar, cocktail party, etc. it is no place to concertize, to express your art, or to push your product. You play among endless chatter, feeling ignored, playing but not being heard, filling the cracks between conversation or becoming a conversation piece for the awkward couple. In fact the only attention you usually get from such a gig is to be interrupted mid-tune by someone asking a question, "Hey! Is that a Martin yer playing there?" As I attempt to maintain the music, I may nod (sometimes I stop suddenly just to make a point), then the comments continue, "Yep, sure sounds like a Martin to me! Should have known by the sound!" (Yep, it has nothing to do with me mister. It's all the guitar.) After 3 hours of this, it can tear up anyone's fortitude, especially the fragile guitar man who needs to be listened to, who desperately needs to be understood. When I finished the final piece of a recent gig (playing background music for a formal dinner), a funny thing happened; the patrons applauded. This wasn't applause as in, "Well thank God THAT'S over with!" No, this was appreciation. Appreciation for the service that I had provided. I think this was the first time I have EVER been applauded for my work at such an event. So what went wrong? These people didn't care what I was doing, they didn't listen, they don't even know my name! You know what was different? I cared and I listened. I guess they did too in a different way. For years I have had a dismissive attitude toward such events grumbling my way through to the pay check. But more recently I am just happy to be working. My ego has stepped aside (or at least is on a break) and I have learned to embrace the background gig, to get out of myself (no easy task), to look up and survey the scene, and realize there is a lot of value to be found among the chatter. I embraced this particular gig from the first note forward and I committed myself to my playing. It was not all about ME after all (guitarists are so arrogant), it was about the music and about them, the diners who were there to enjoy the evening with their friends, families, or lovers. They were into the night and I was into providing good vibes. I was adding value to the experience. I noticed the joy around me and, lo and behold, the joy of playing! I was in the zone and playing for real. I mean, how may times have I checked out at the midpoint? Not on this night. I was fueled by the occasional tapping foot, the smiles sent my way, the food, the wine, and the warmth. When I paused - between tunes - there was a noticeable change in the dynamic of the room. I was in control and I too was having fun. What are those silly sayings? "Dance like no one is watching!" "Work like you don't need the money!" Maybe I have a new one: "Play like no one is listening!" or rather, "Play like everyone listening!" or maybe just "Play like one person is listening!" No bother. Just play and mean it. By giving the people an honest effort, you just might get what every sensitive performer needs, maybe, you will get some applause.